It is truly everywhere. Children trudge home from school toting them with a heavy load of items – books, clothes, games and other useful items. But for some in four community learning centers in Akron, the backpack is a lifeline, saving the elementary students from hunger. These are the children who receive free or low-cost breakfasts and lunches at their schools. But, if not for the Blessings in a Backpack program, they would go hungry on the weekends. Blessings in a Backpack, a non-profit volunteer organization, fills those backpacks each week with enough food to sustain a child over the weekend. Hudak, a member of St. Hillary’s Church, is in her fourth year with the Blessings in a Backpack program. She, along with others in her parish discovered the critical needs of the Helen Arnold Learning Center when members of her church began volunteering at the learning center, helping in any way they could by volunteering for reading and other programs at the learning center. Some of the women quickly realized the needs of the children were met during the week, including feeding them breakfast and lunch. But, on the week-ends, the children did not get enough to eat. The women, driven by Debbie Pianalto and Jill Eicher contacted the national Blessings in a Backpack program and began the process of joining with the national organization. Eicher, Pianalto, Hudak and Kelly Ann Behrens now form the board at the Akron Blessings Chapter. The national movement was founded in 2005 in Louisville, Kentucky when a concerned school teacher brought the issue of weekend hunger to a local philanthropist, according to the organization’s director of marketing and public relations, Nikki Grizzle. “The first school started with 50 children and that program continued to grow organically from there,” said Grizzle. In 2008 Blessings became an official 501(c)3 non-profit organization. It has grown to provide meals for more than 76,000 children in 800 schools in 44 states and the District of Columbia, according to Grizzle. 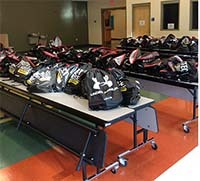 In Ohio, there are 39 schools committed to Blessings in a Backpack, feeding more than 4,800 students. “Blessings in a Backpack mobilizes communities, individuals and resources to provide food on the weekends for elementary school children across America who might otherwise go hungry,” said Grizzle. Joining the national organization with its lofty goals was not an easy task, according to Hudak. “We got the information from Kentucky and discovered we had to commit to the program for three years,” Hudak said. She said she and a small core of volunteers had to line up sponsors, find volunteers and raise the necessary funding to commit to the project for a minimum of three years. “It costs $80 per child each year to provide food for 38 weekends,” Hudak said. 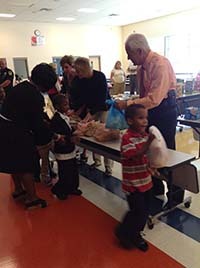 The Akron Blessings program started by feeding 325 elementary students at the Helen Arnold Learning Center. Since its formation, the women have increased their efforts to feed 260 more students at McEbright Community Learning Center, 50 more children at Crouse Community Learning Center and 50 more at Schumacher Community Learning Center. Each backpack contains enough food items for the child to get through the weekend. 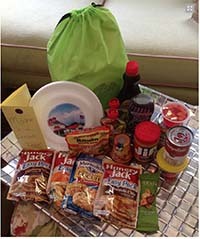 “We pack foods that are easy to eat or prepare – granola bars, juice boxes, oatmeal, mac and cheese,” Hudak said. “What motivates us? Making an impact on these kids,” Hudak said. The volunteer teams pack the weekend items at the learning centers in the evening after school is dismissed. The volunteers rarely get to see the children receiving their food items. Blessing volunteers note the consequence of hunger is much more than a growling stomach. Poor nutrition can result in a weaker immune system, lower IQ, shorter attention spans and lower academic achievement. 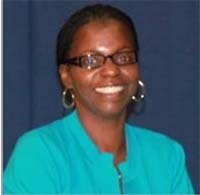 Helen Arnold Community Learning Center Principal LaMonica Davis will testify to that. She has been observing the results of the backpack program since its inception. “Since the program began we have seen a dramatic increase in attendance, test scores have gone up and behaviors have improved” Davis said. Davis called it amazing that one little bag of food can make such a difference for the students. “And the students are grateful. They really appreciate what they are given,” Davis added. There’s another blessing that has come with the backpacks, according to Davis. The students are learning compassion and empathy. They share their food with their siblings who aren’t in school and have become aware of others who are in need. “Sometimes the volunteers give us extras and the students will ask if they can give them to someone they know who needs it. They have learned to be the givers,” Davis said. “Right now we’re trying to sustain what we have. It is a huge commitment and it takes a lot of people,” Hudak said. 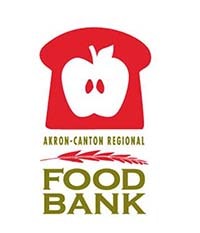 She said she is very gratified by the group’s teaming up with the Akron Foodbank. Hudak’s group is also very grateful to local sponsors including Donzell’s, Giant Eagle, Hudson’s Restaurant, Papa Joe’s, barre pose, Towpath Tennis and Don Drumm Studios and Gallery. “They have been so generous,” she said. 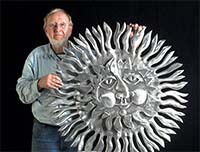 Artist Drumm has even designed exclusive ornaments for the local backpack program for sale at Christmas. They are available through the group’s website. The group has various fundraisers throughout the year and also has benefited from assistance by various civic organizations. 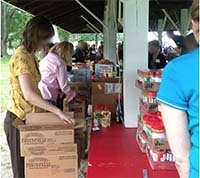 For more information, or to volunteer or donate to the backpack effort, visit its website: www.blessingsakron.org. 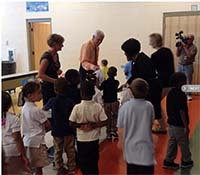 This entry was posted in Education, Food, Health, Neighborhoods, Poverty, Youth and tagged 800 students., Akron, Akron Community Foundation, Akron Public Schools, Akron-Canton Regional Foodbank, Backpacks, barre pose, Blessings in a Backpack, Children, Christ Child Society of Akron, Civic Organizations, Community Learning Centers, Compassion, Crouse Community Learning Center, Don Drumm Studios and Gallery, Donzell’s, Elementary Schools, Feeding more than 4, Fundraisers, Giant Eagle, Helen Arnold Learning Center, Hudson’s Restaurant, Hunger, Leadership Akron, McEbright Community Learning Center, non-profit organization, Papa Joe’s, provide food on the weekends, Schumacher Community Learning Center, St. Hillary’s Church, The Howland Memorial Fund, The Vernon Odom Fund, Towpath Tennis, Tuscora Park Health & Wellness Foundation, Volunteers, Women In Touch with Akron's Needs. Bookmark the permalink.